Mr. 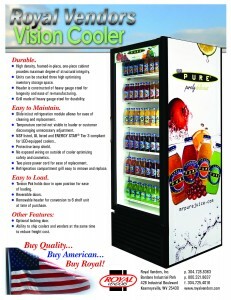 Pure – Vision Cooler — Royal Vendors, Inc.
Units can be stacked three high optimizing inventory storage space. Header is constructed of heavy gauge steel for longevity and ease of re-manufacturing. Temperature control not visible to loader or customer discouraging unnecessary adjustment. NSF listed, UL listed and Energy Star® Tier 3 compliant for LED-equipped coolers. No exposed wiring on outside of cooler optimizing safety and cosmetics. Two piece power cord for ease of replacement. Refrigeration compartment grill easy to remove and replace. Removable header for conversion to 6 shelf unit at time of purchase. Ability to ship coolers and venders at the same time to reduce freight cost.